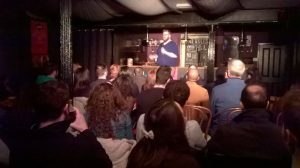 We’re eagerly anticipating the start of this year’s Leicester Comedy Festival because we love a good giggle here at Manhattan34. There will be over 830 shows taking place across the two and a half weeks of the festival. And 6% of those shows will be taking place right here, on Rutland Street. We’re pretty confident that we have more comedians at our venue than anyone else in the city. The majority of the shows we put on are free or pay what you want. We still highly recommend that you use the Comedy Festival’s official website to book tickets in advance. Due to very high demand, DMU graduate Sarah Keyworth has already had an additional date put on, on the 10th February. The Dark Horse show holds great promise with an hour of brand new stand up material. So you see, even (especially?) free shows are likely to sell out. The Jokes On Us Free Festival is in high demand! We’re old hands at being a venue for the Comedy Festival now. We think you’ll find the set up pretty cosy. There aren’t many places you can sip on some of the best quality cocktails in the city whilst having your ribs tickled. Many of our events are in the Cellar Bar, so you’ve got lots of options for chilling out and meeting your friends in the main bar before the show. And of course the bar will be open during the interval. Why not try some of our exclusive spirits while you’re here, like beautiful bourbon from Buffalo Trace? Head over to our What’s On page for up to the minute listings of our shows. The comedy festival began in 1994 with 40 events held over 7 days. From a student project, the festival has now grown in to one of the top 5 comedy festivals in the world according to the Guardian. 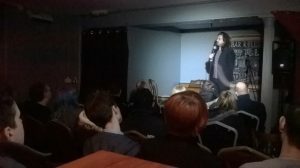 There is always a healthy mix of big names and local grassroots comedy taking place. Many household names from TV found their feet at the Leicester festival and it has catapaulted many fantastic talents into the limelight. Always innovating, in 2014, the first ever UK Pun championship was held which was won by Darren Walsh.